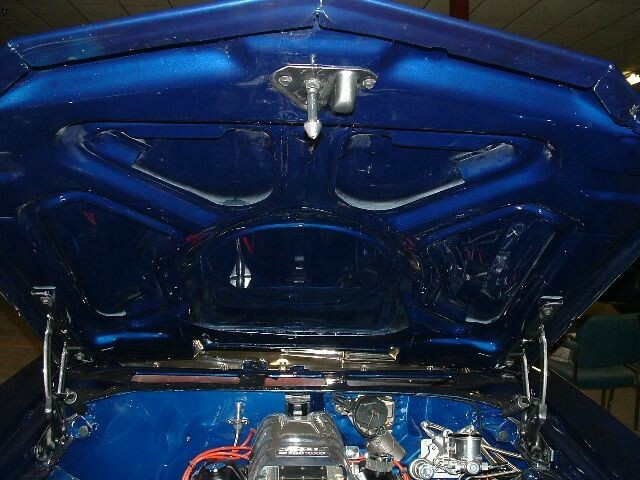 A COMPLETE BODY OFF NUT AND BOLT RESTORATION THAT WAS 2 YEARS IN THE MAKING. 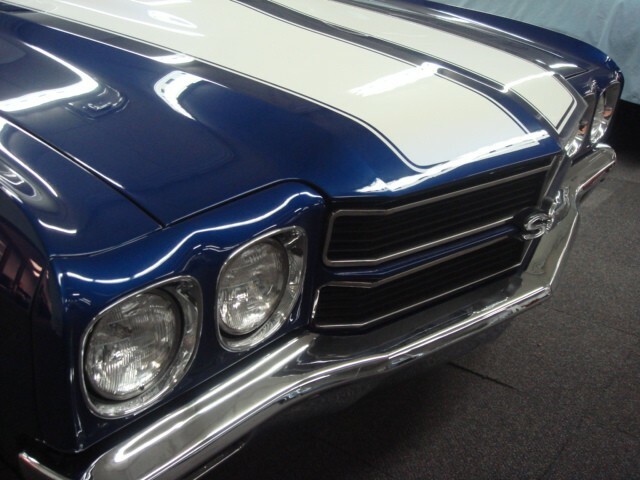 ONE OF OUR SIGNATURE CARS. 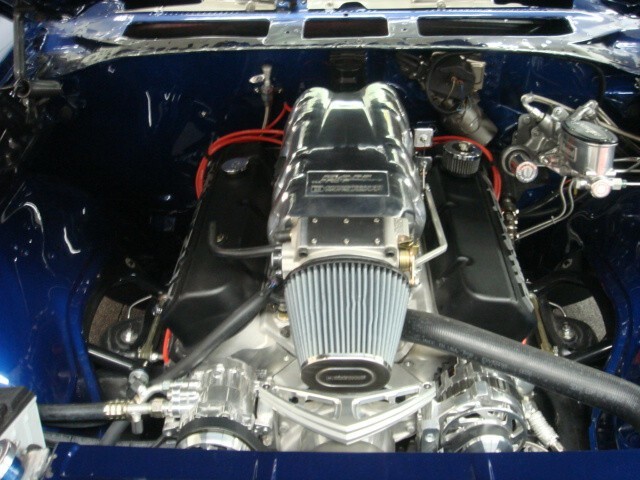 THIS CONVERTIBLE STARTED OUT AS A 41,000 MILE ARIZONA CAR IT WAS SUPER CLEAN AND RUST FREE CAR BEFORE WE STARTED TO STRIP IT TO BARE METAL AND BUILD IT UP, IT IS GAPPED TO PERFECTION, LASER STRAIGHT, THE PAINT IS FLAWLESS, THIS CAR SCORED 999 OUT OF 1000 AT CHEVY-VETTE FEST IN THE FALL OF 2006. 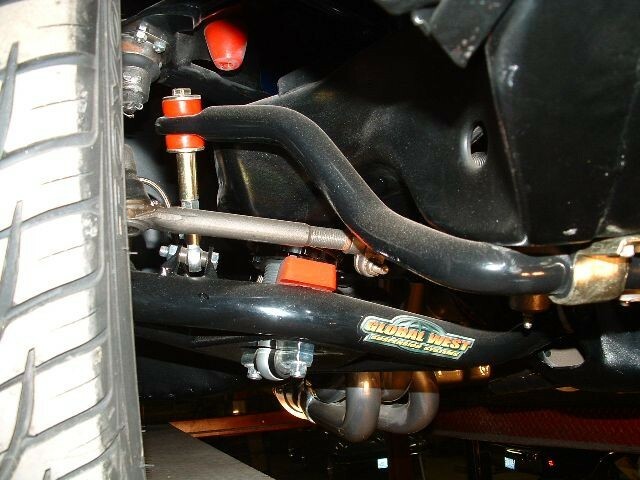 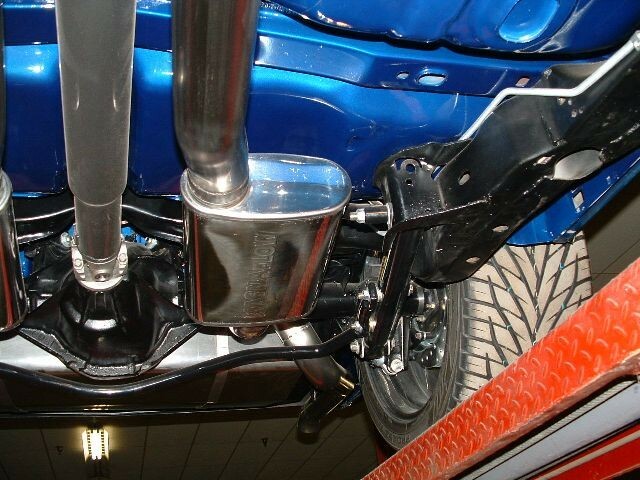 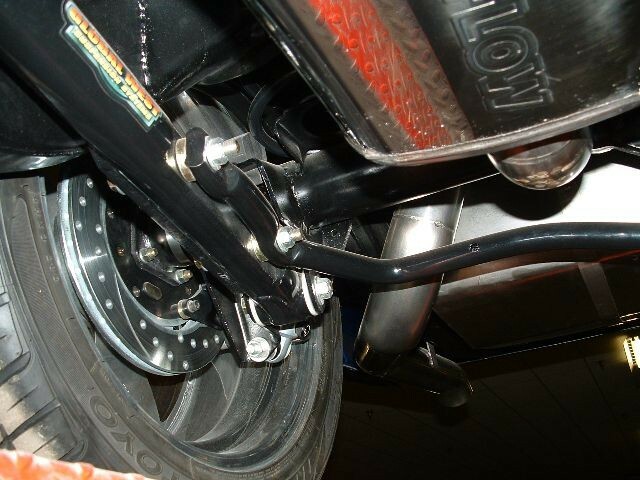 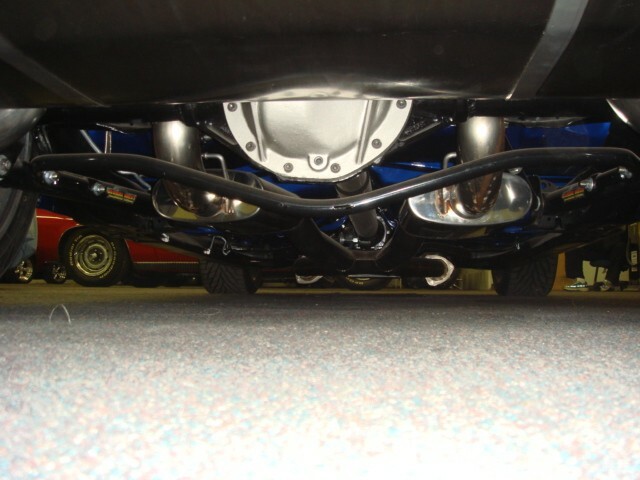 LOTS OF CUSTOM WORK INCLUDING COMPLETE GLOBAL WEST SUSPENSION FRONT AND REAR, QA1 COIL OVERS, ALL STAINLESS FUEL TANK AND 3 INCH CUSTOM STAINLESS EXHAUST. 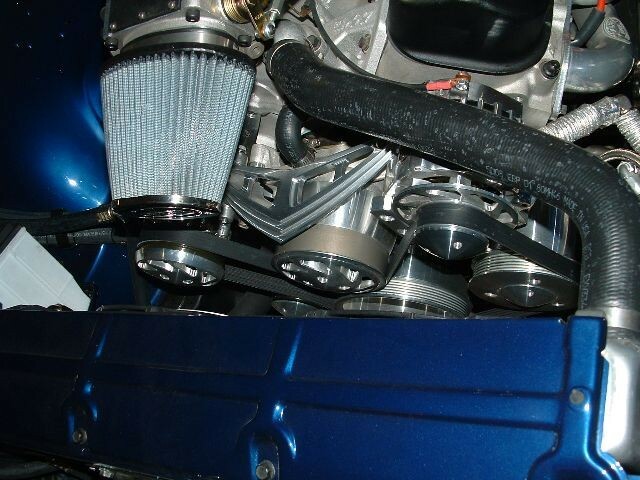 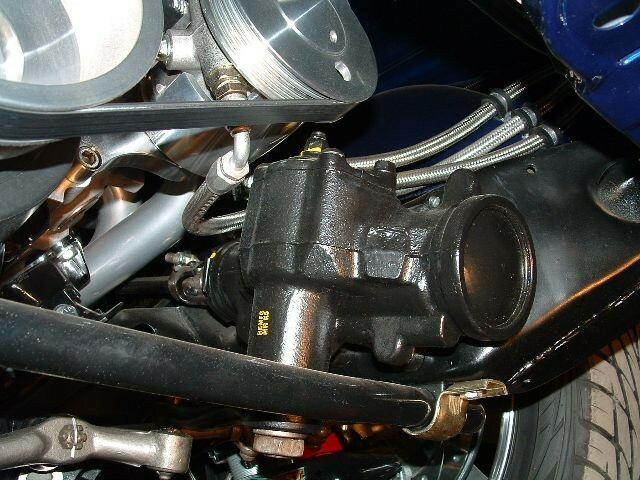 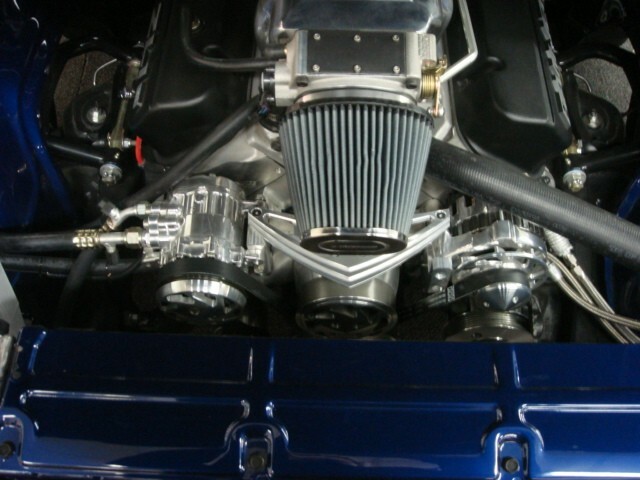 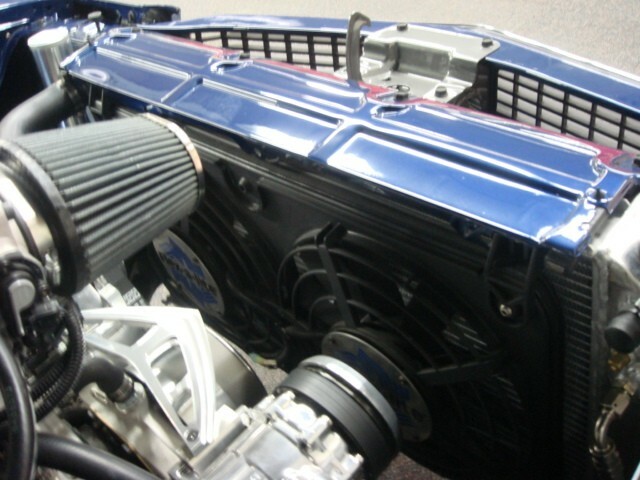 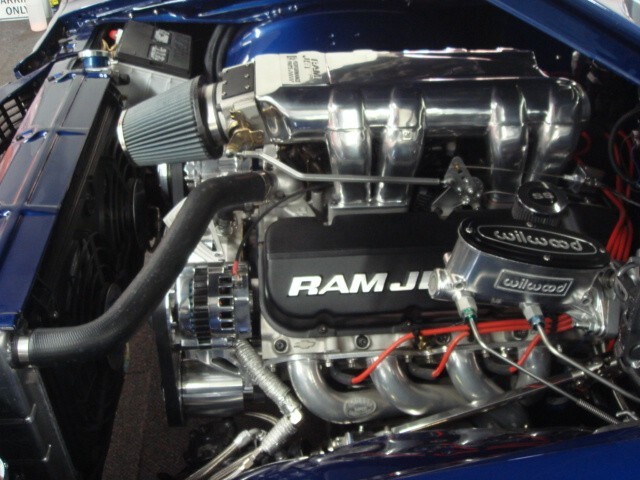 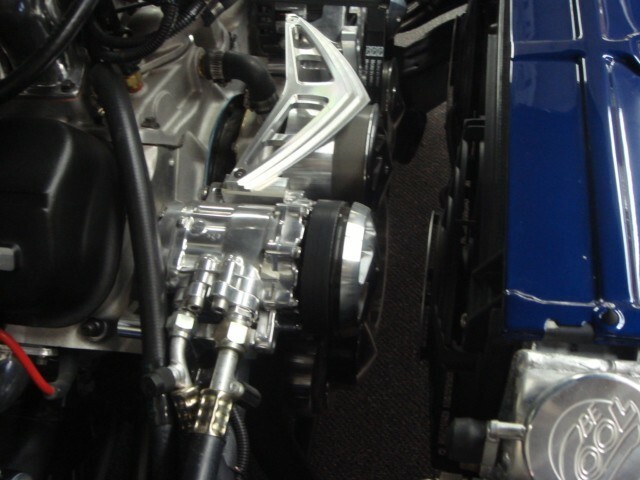 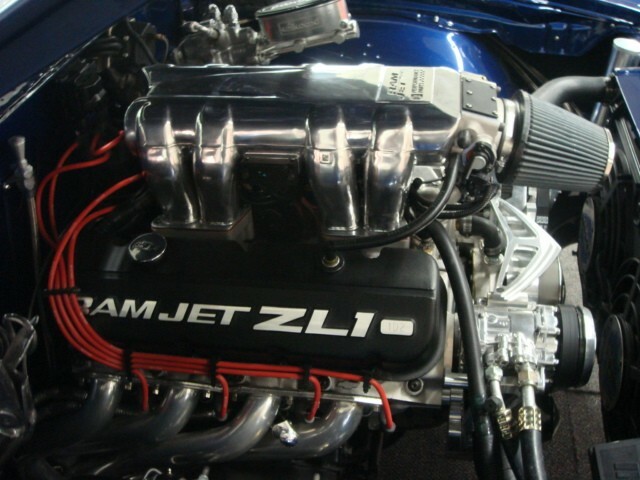 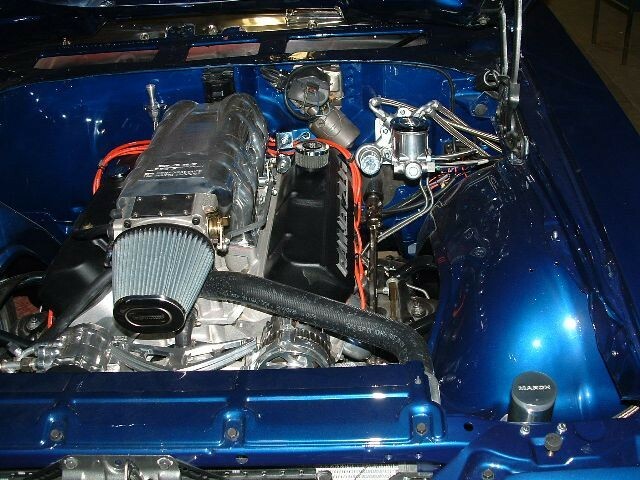 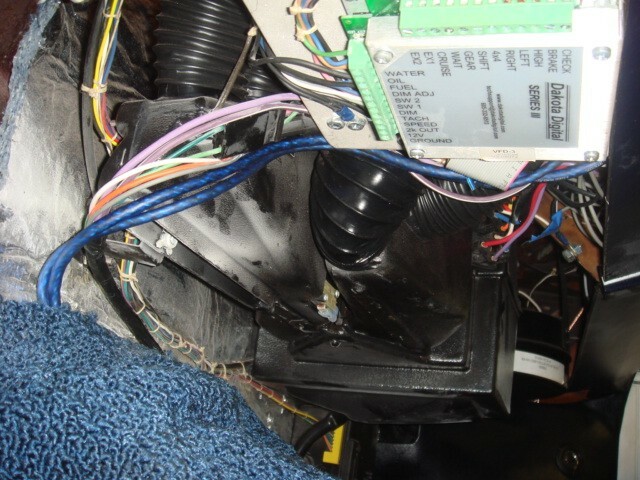 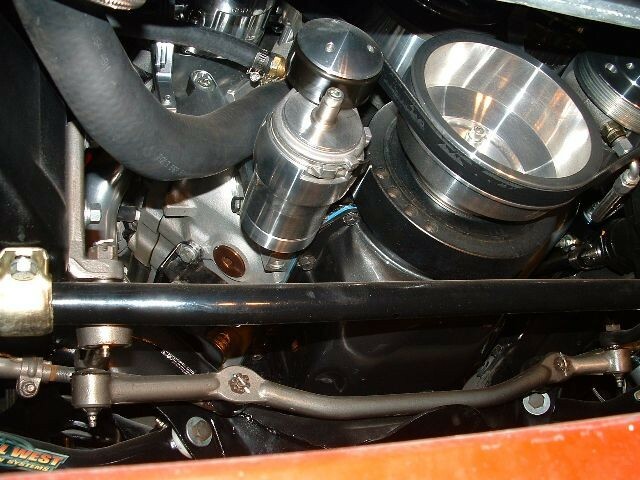 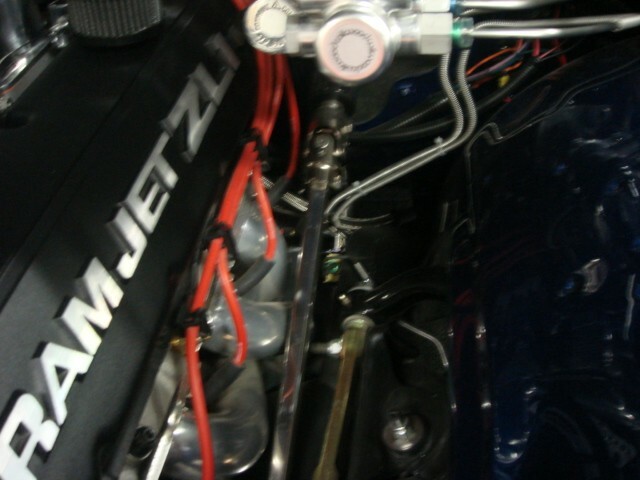 THE HEART OF THE CAR IS A VERY HARD TO GET RAMJET ZL-1 LIMITED PRODUCTION MOTOR #102 OUT OF 200. 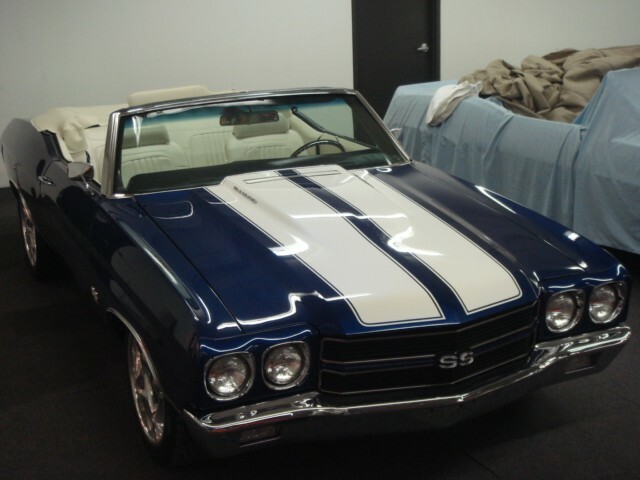 THIS CAR HAS THE BEST OF EVERYTHING, TO MUCH TO LIST. 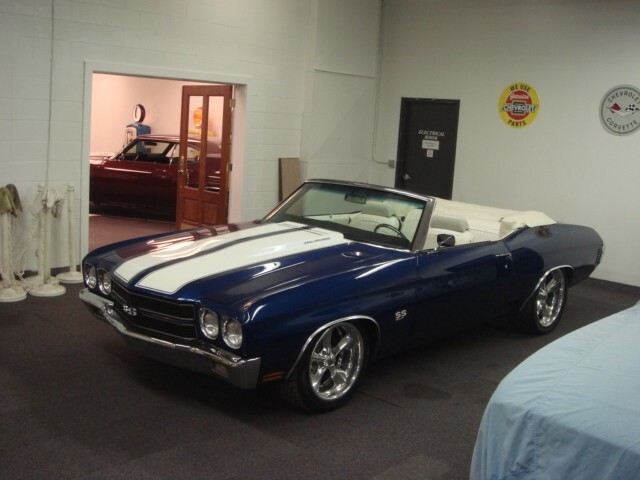 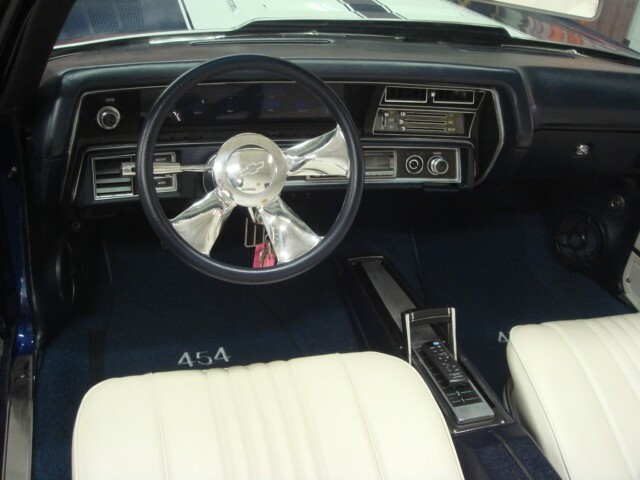 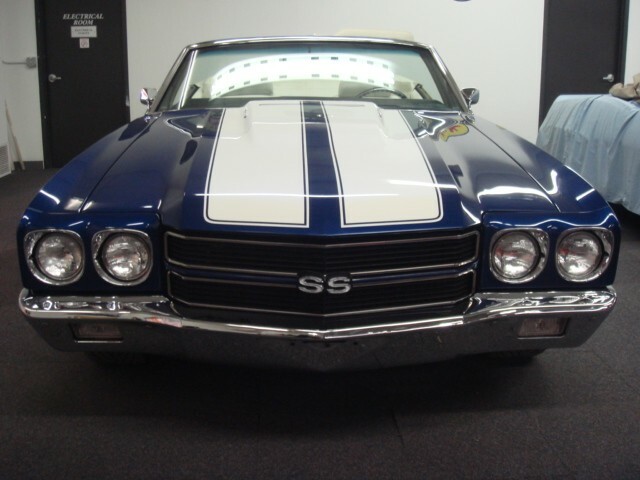 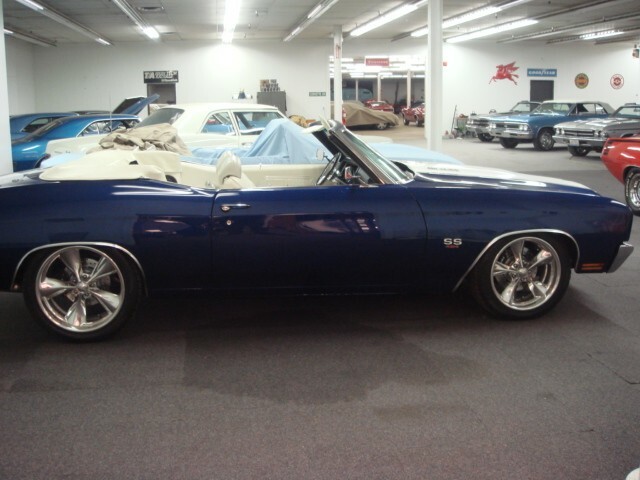 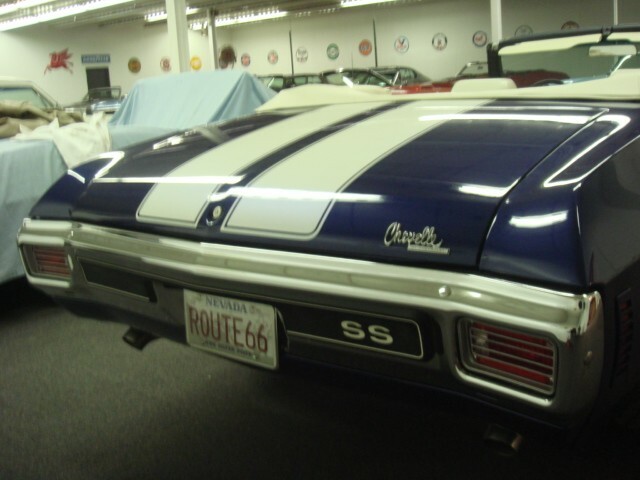 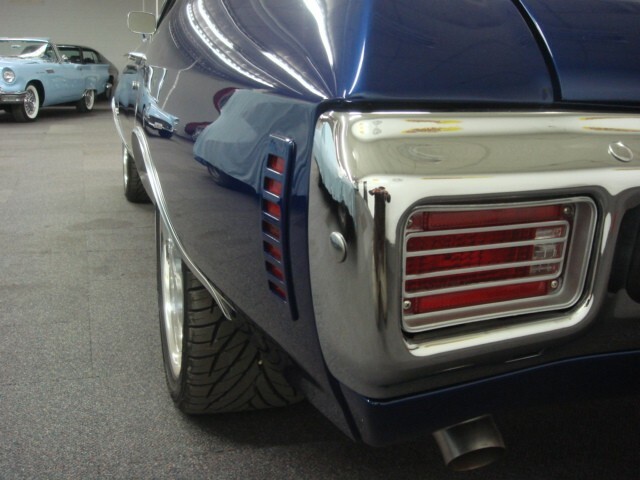 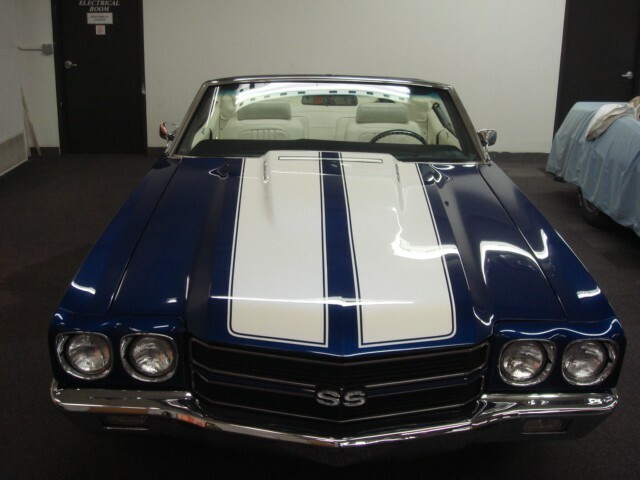 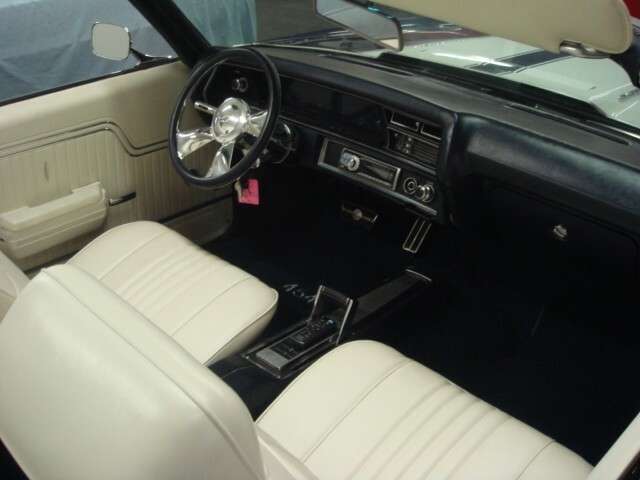 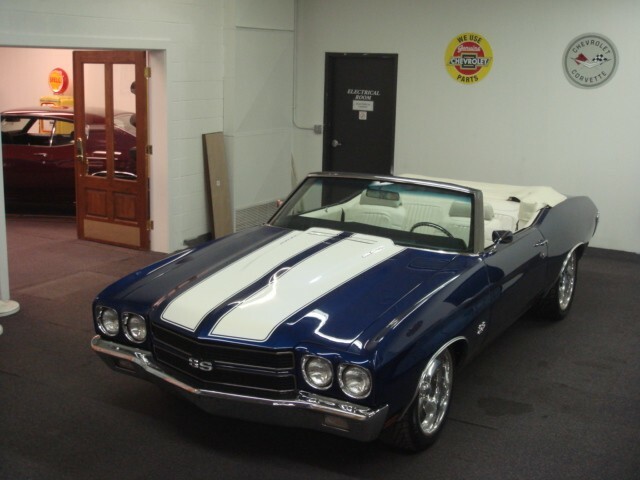 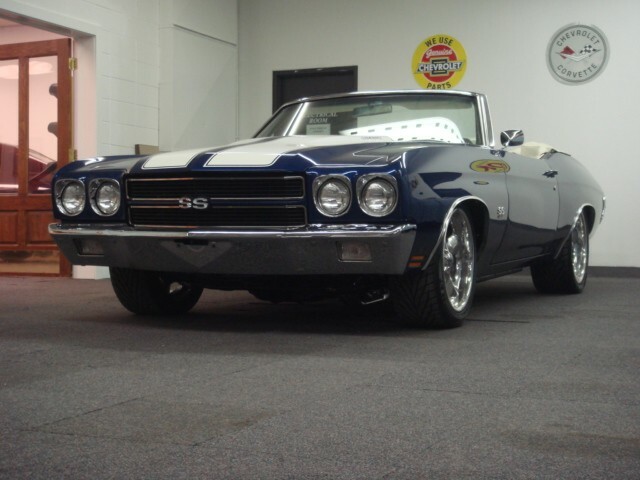 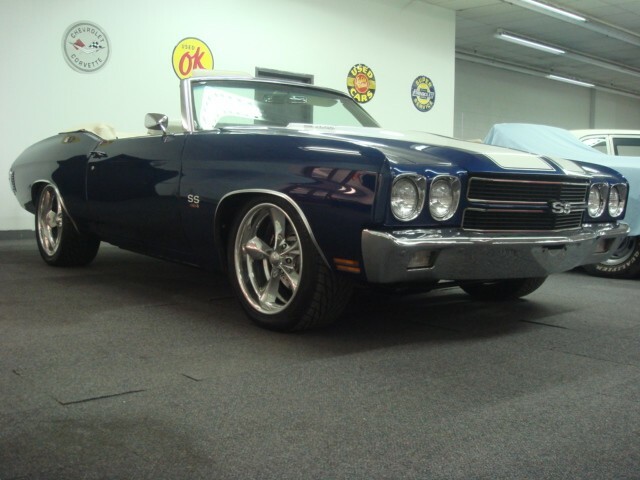 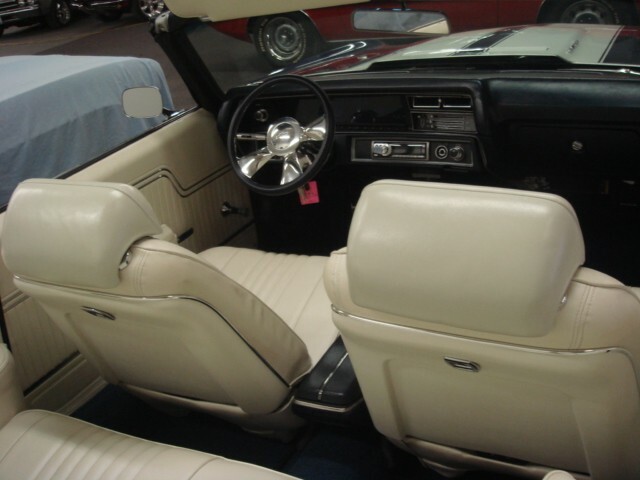 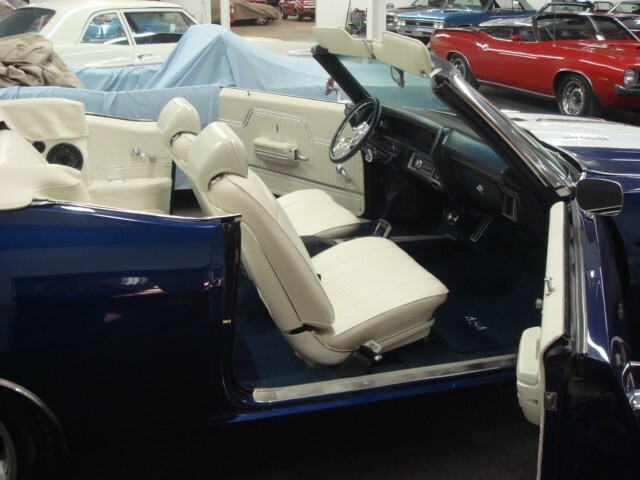 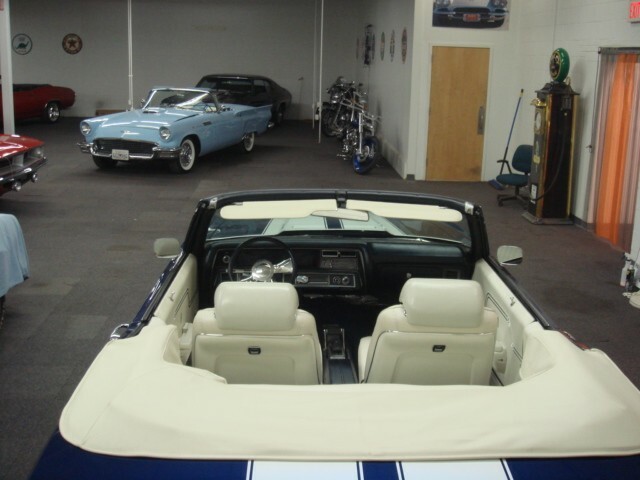 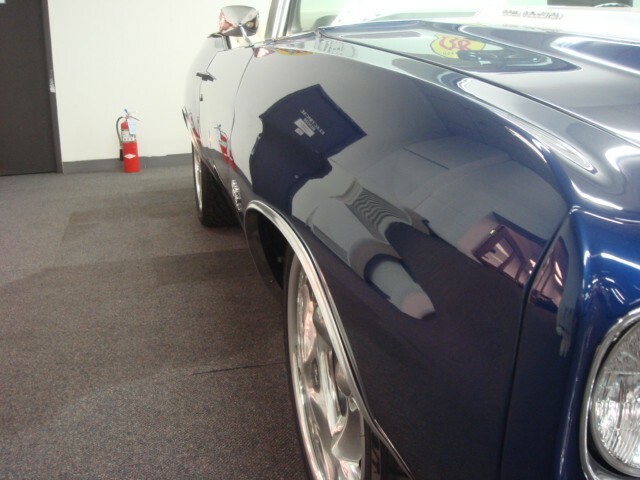 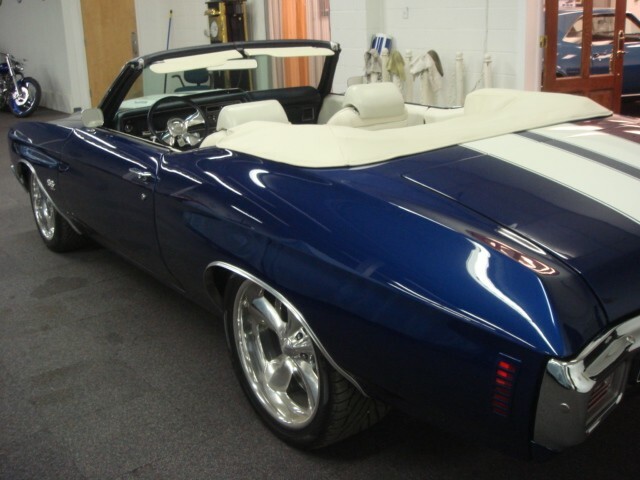 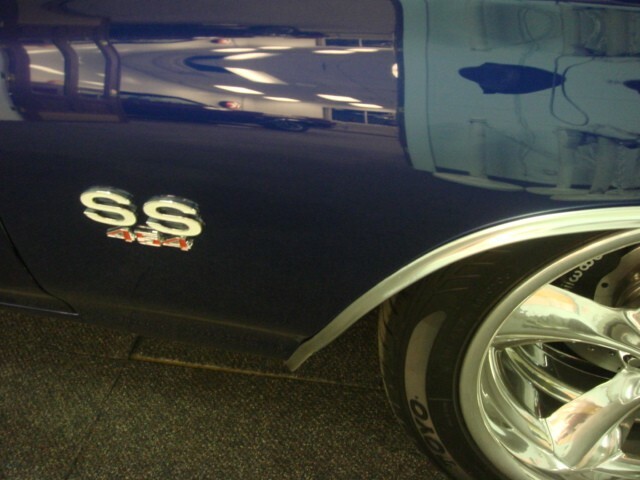 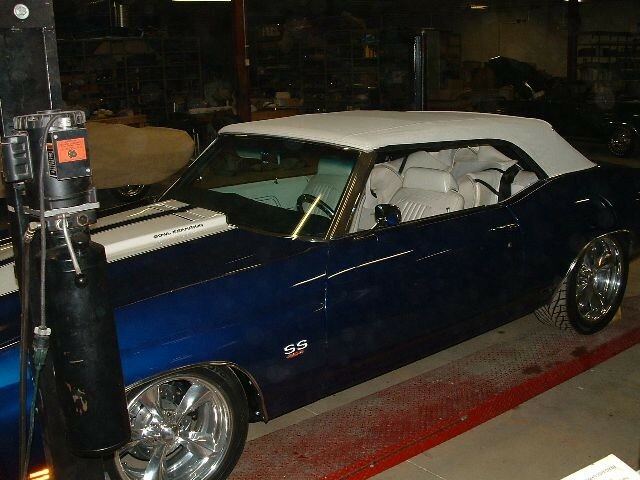 FROM THE START IS WAS BUILT TO BE THE NICEST 1970 CHEVELLE CONVERTIBLE IN THE COUNTRY. 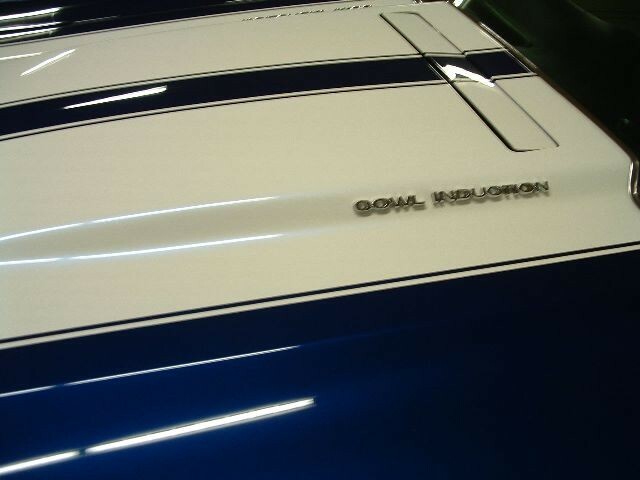 EMAIL OR CALL US FOR MORE INFORMATION ON THIS ONE OF A KIND PRO TOURING SUPER CAR. 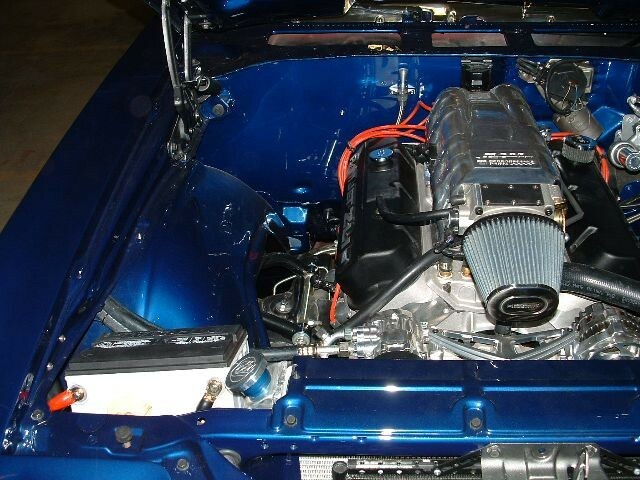 A MIDWEST MUSCLE CARS EXCLUSIVE SHOW WINNING BUILT VEHICLE. 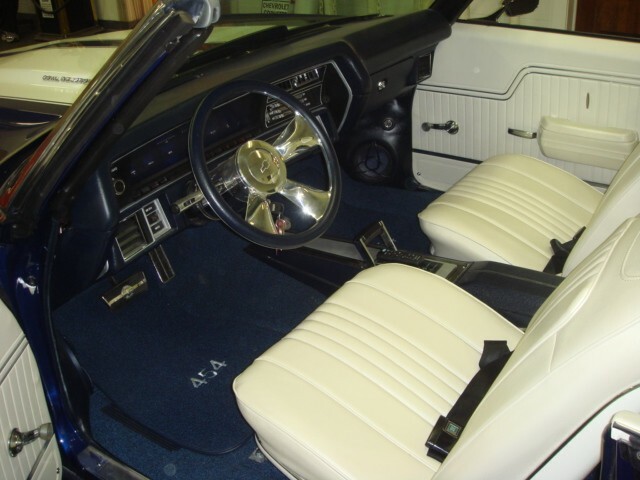 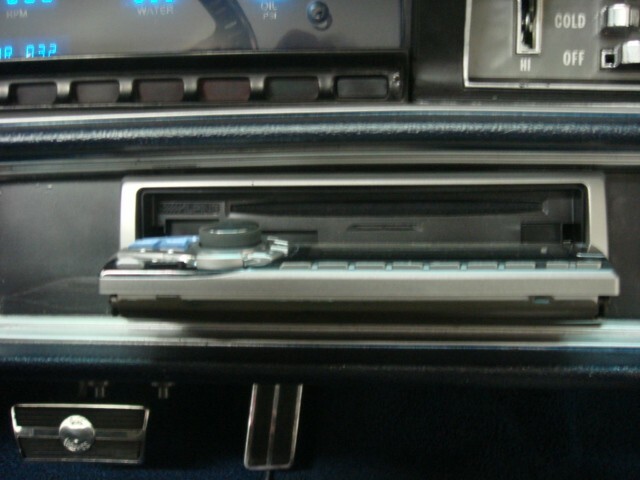 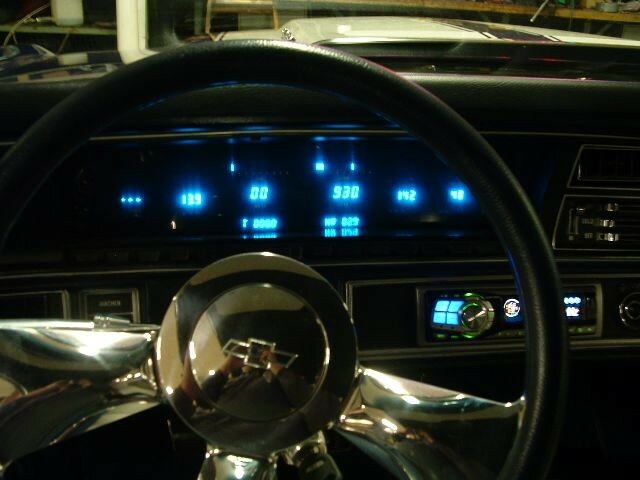 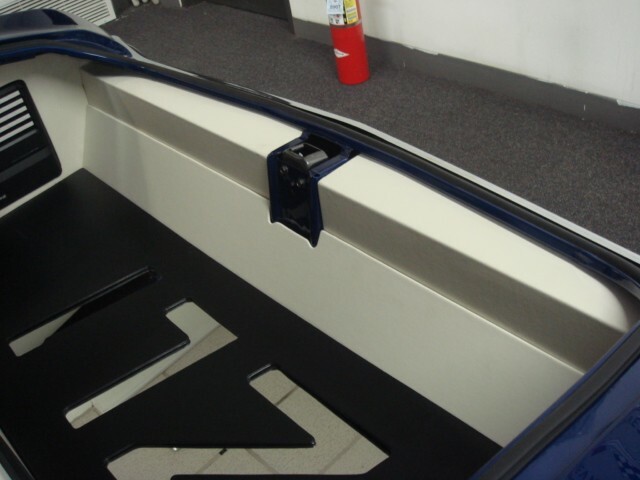 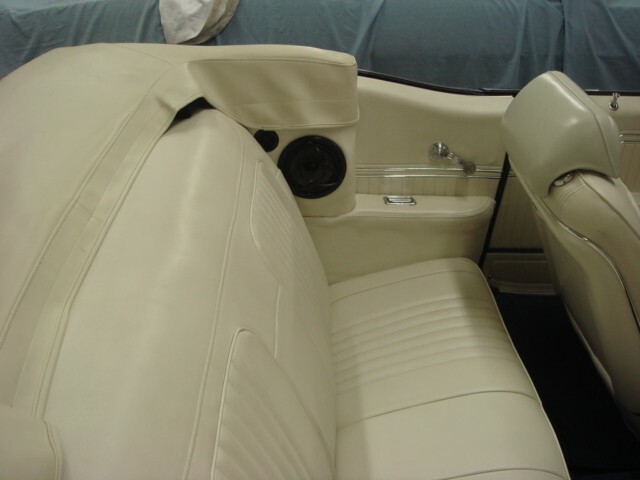 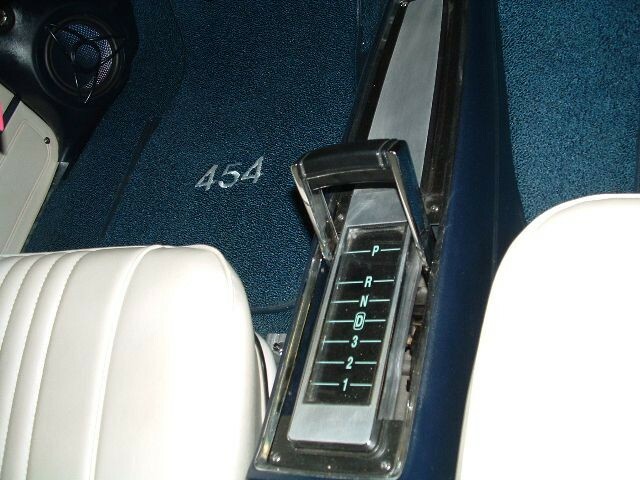 ALL DARK BLUE DASH, CONSOLE, KICK PANELS, CARPET WITH NEW SNOW WHITE INTERIOR. 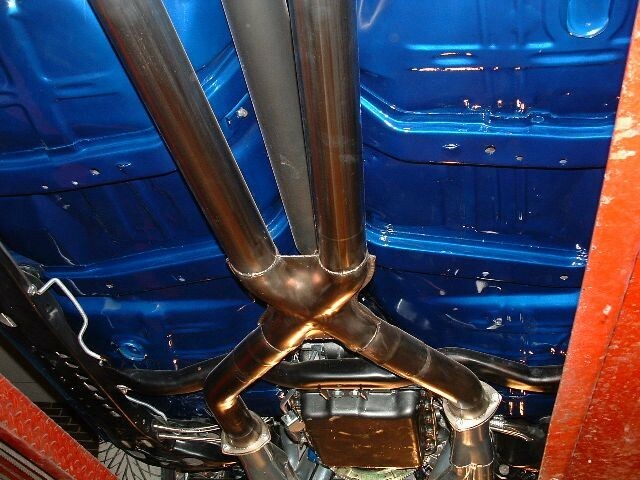 LOTS OF ALUMINUM. 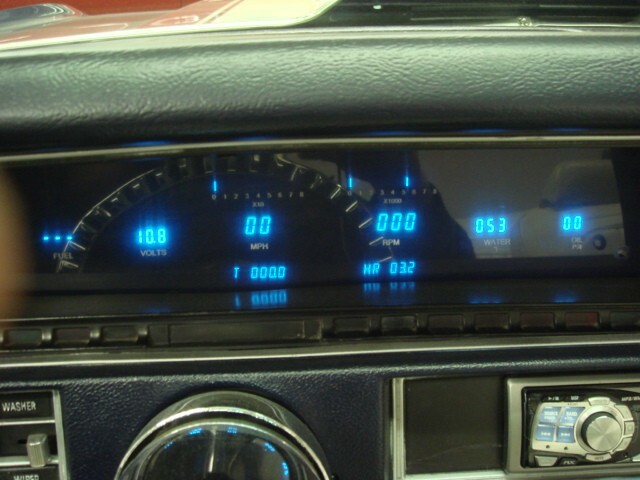 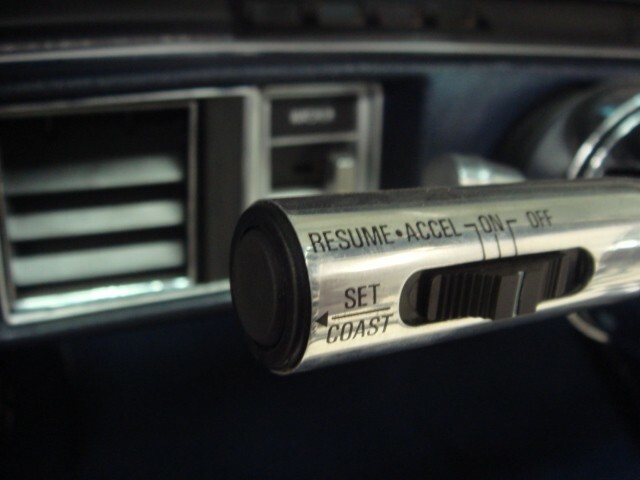 DIGITAL DASH THAT CAN BE SEEN DAY OR NIGHT WITH EASE. 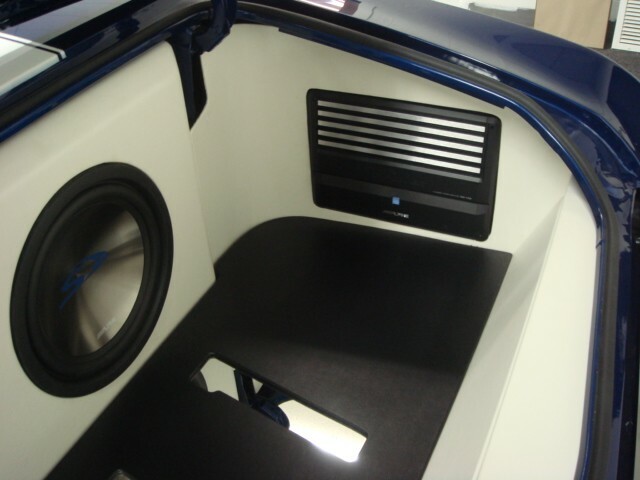 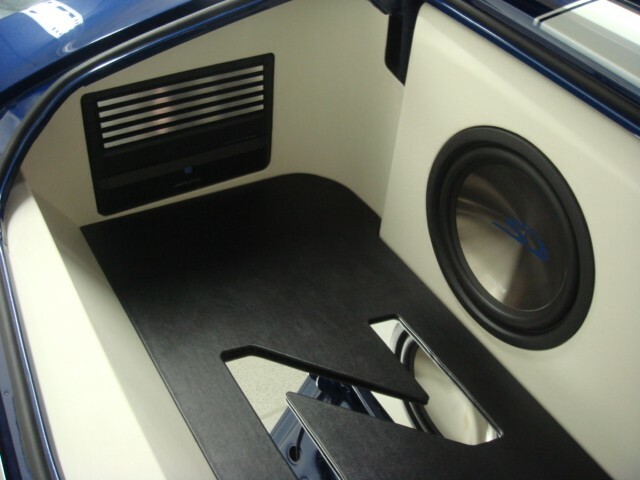 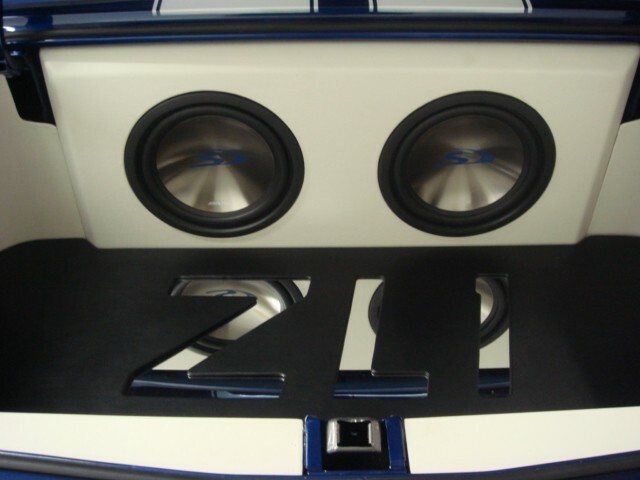 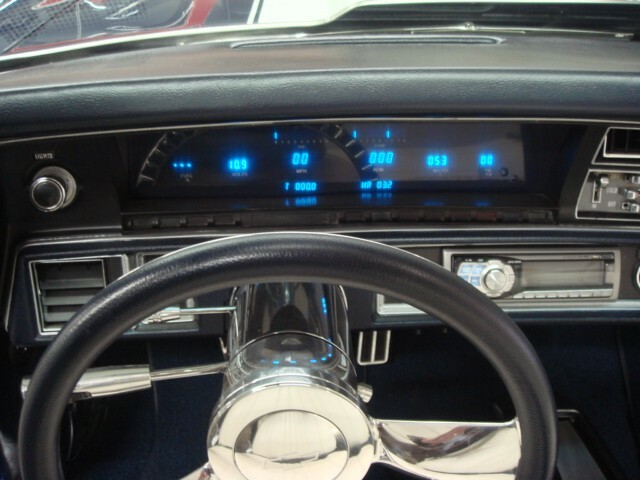 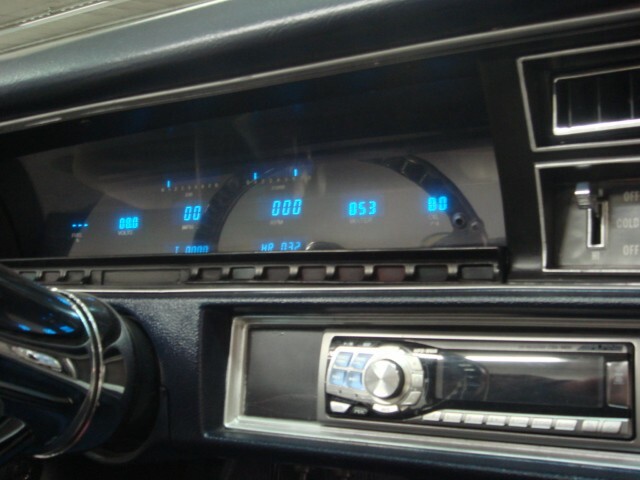 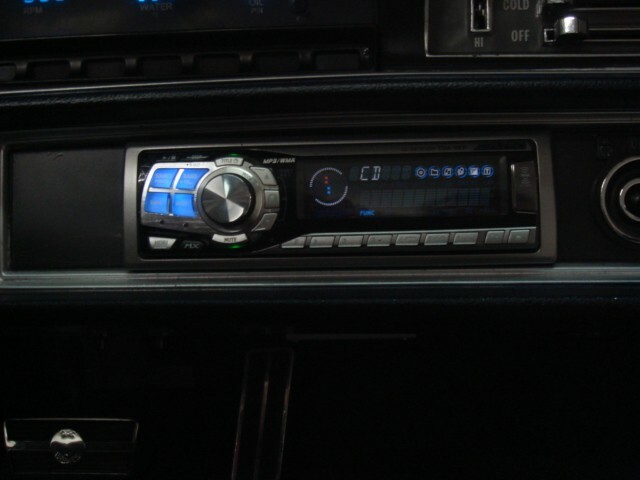 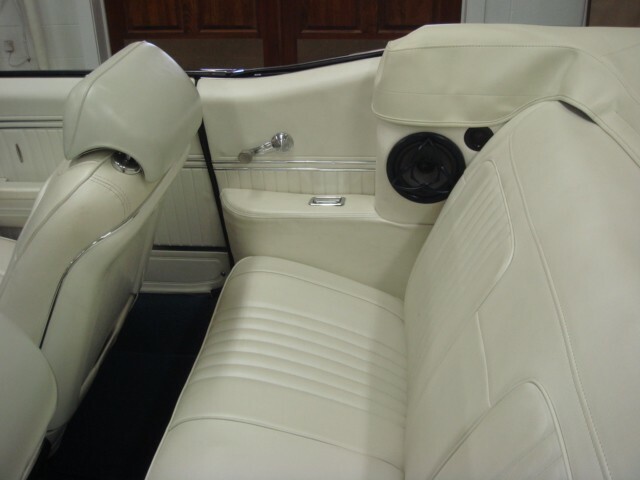 FULL CUSTOM ALPINE STEREO, LOTS OF STAINLESS WORK, THE BOTTOM LOOKS BETTER THAN THE TOP OF MOST CARS. 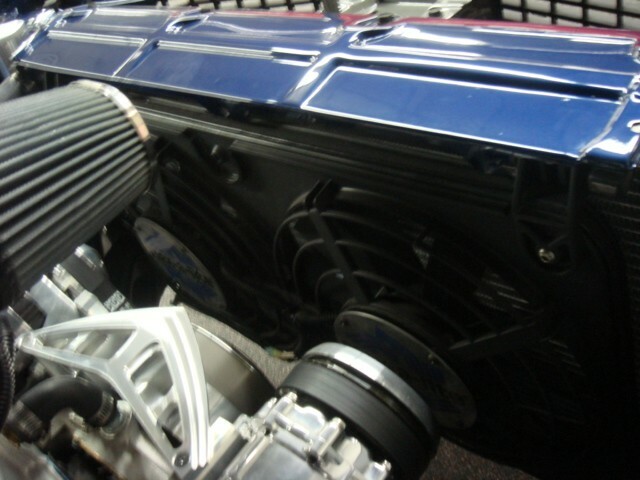 ALL THE GOOD GUYS STUFF WENT INTO THIS BUILD. 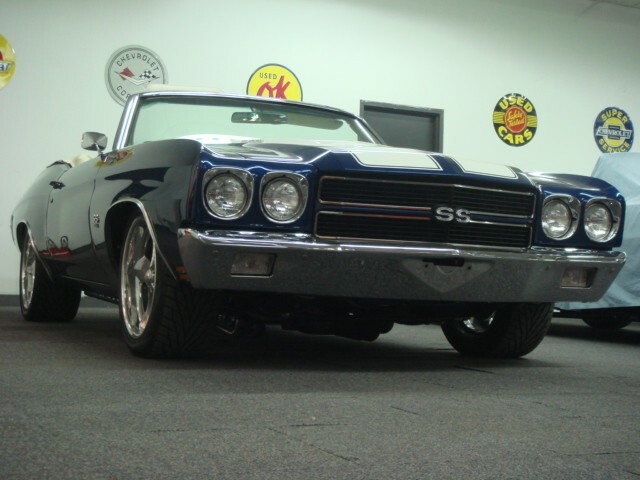 HYDRA BOOST BRAKES, MARCH PULLEY SYSTEM, BEST OF THE BEST, LIMITED PRODUCTION ALUMINUM ZL1 RAMJET. 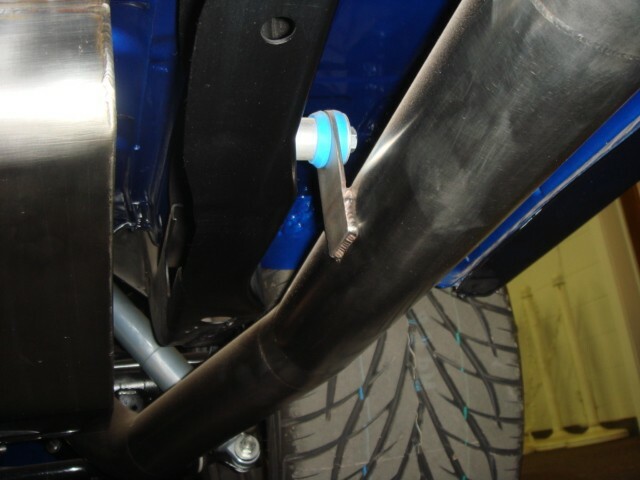 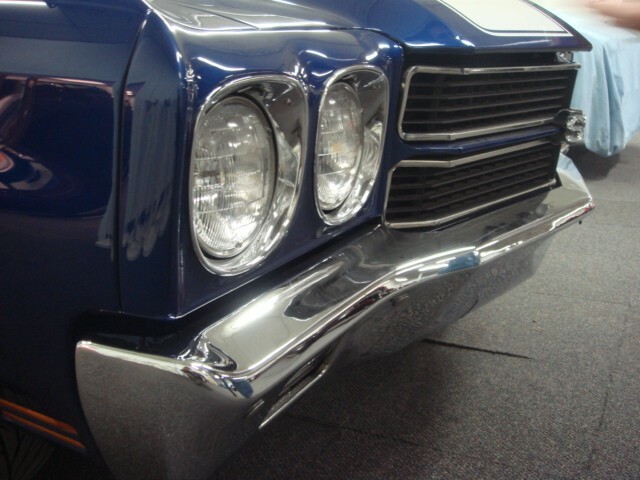 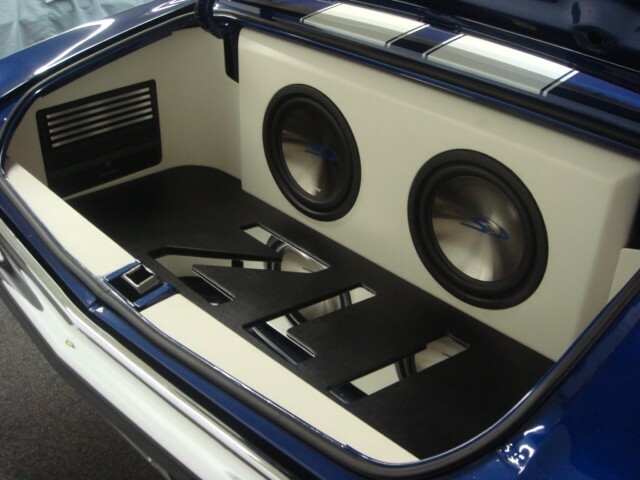 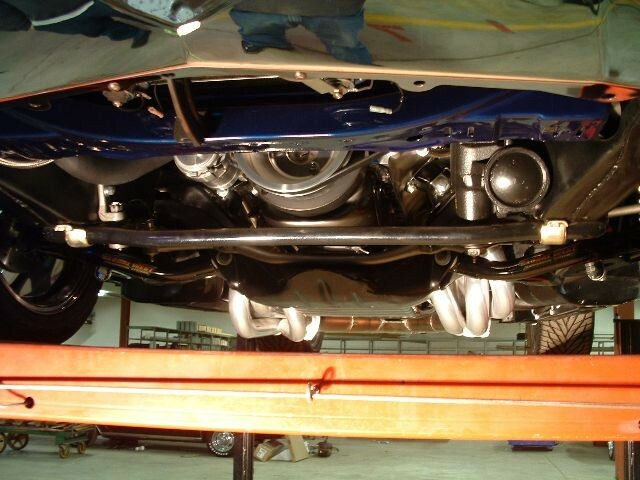 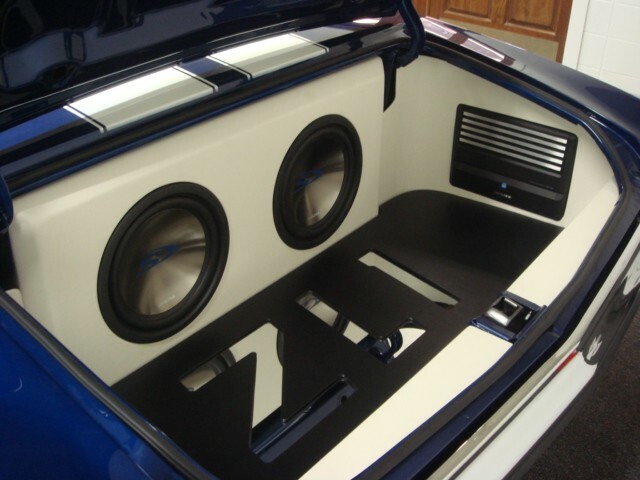 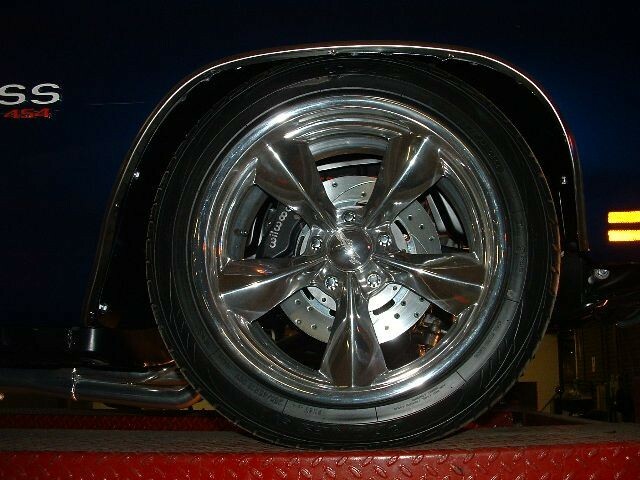 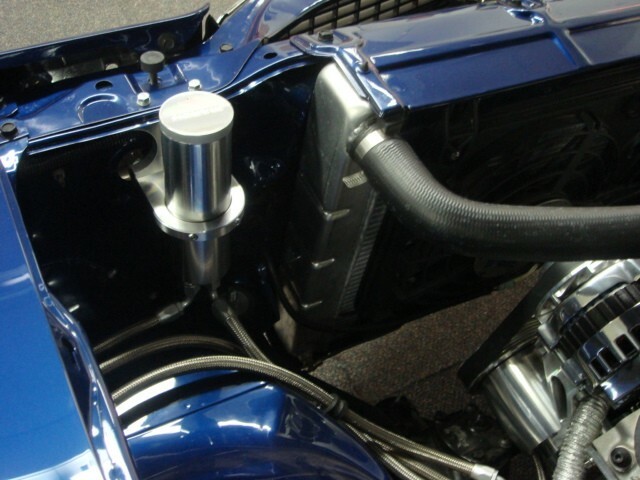 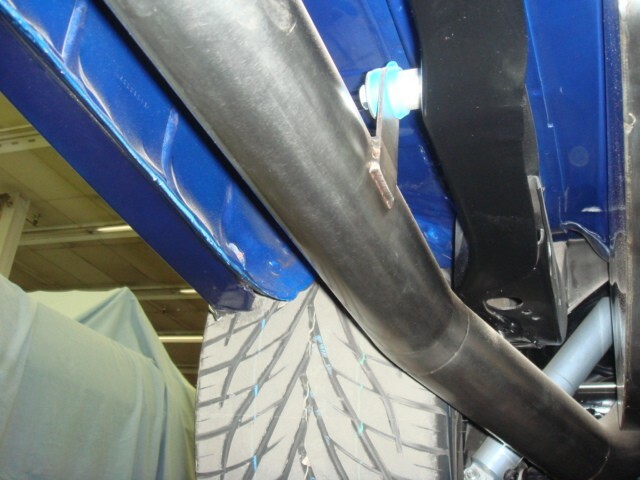 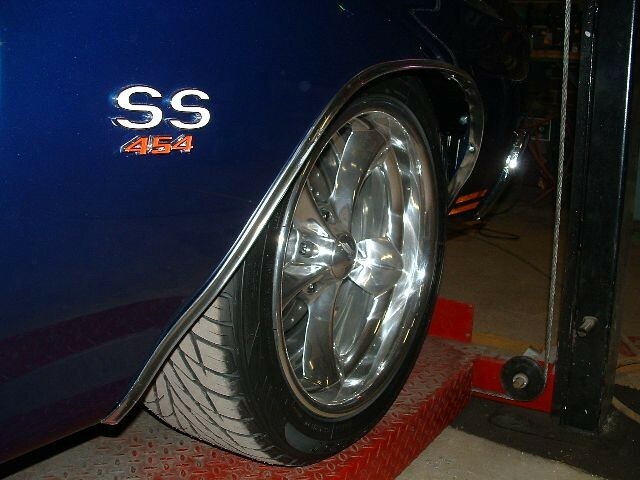 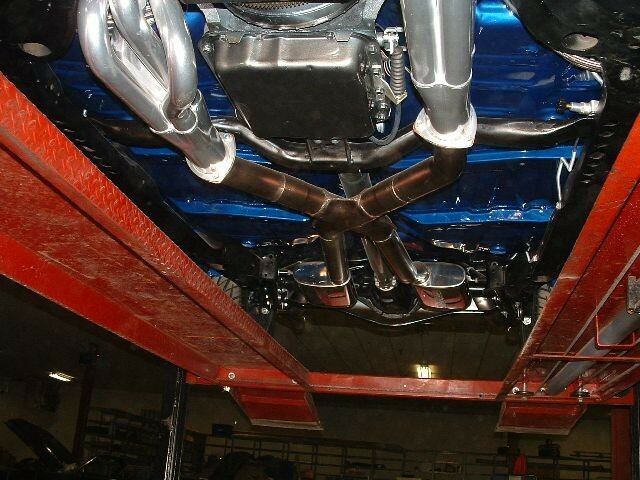 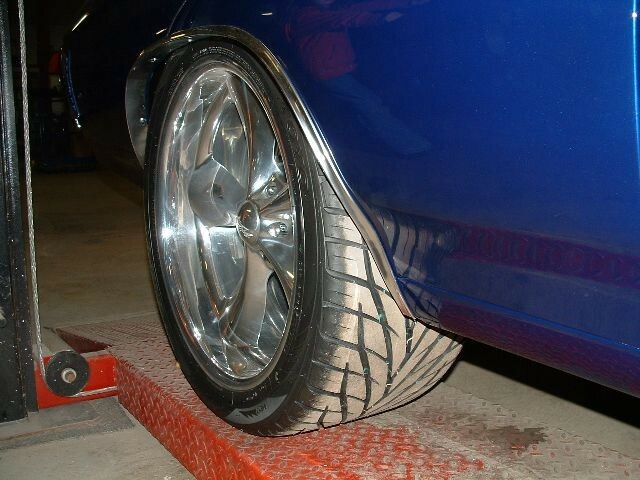 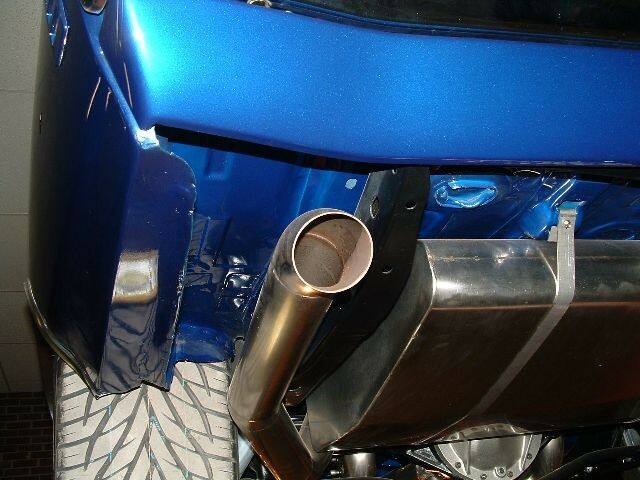 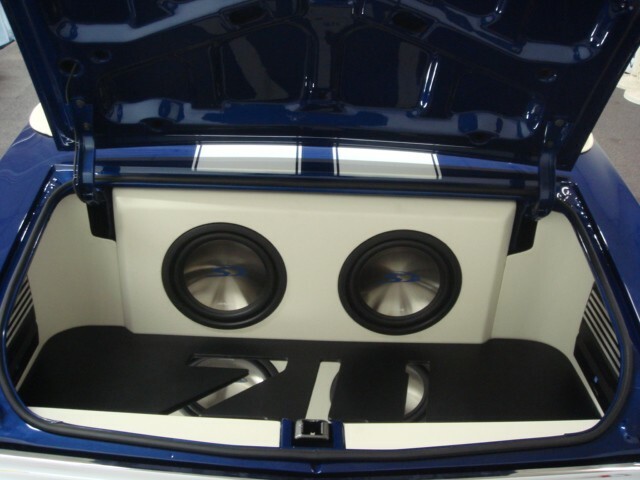 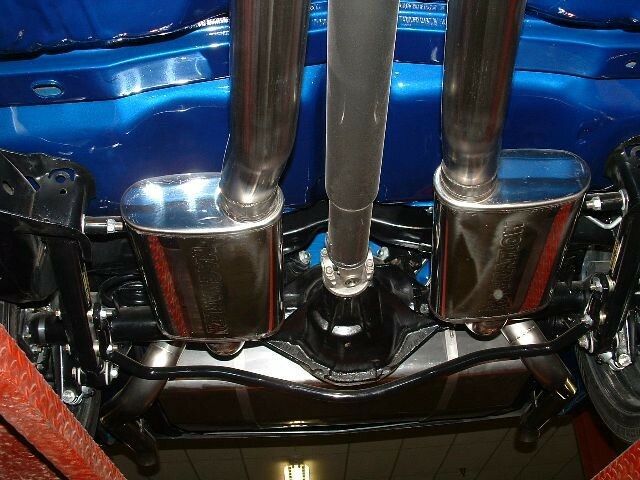 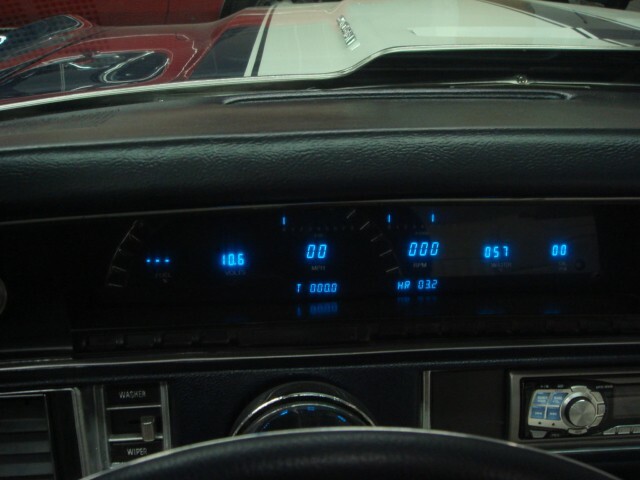 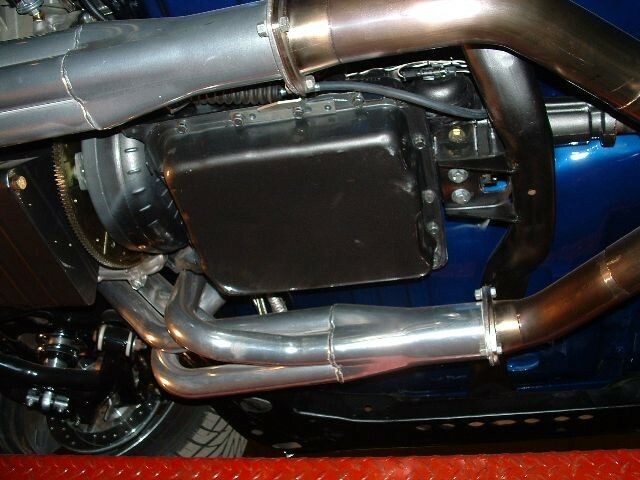 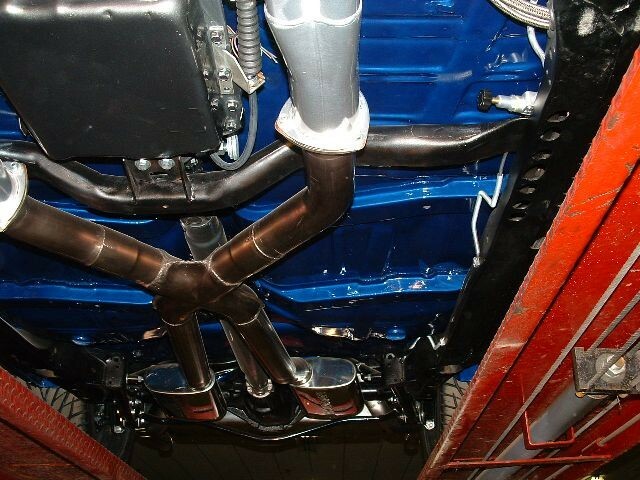 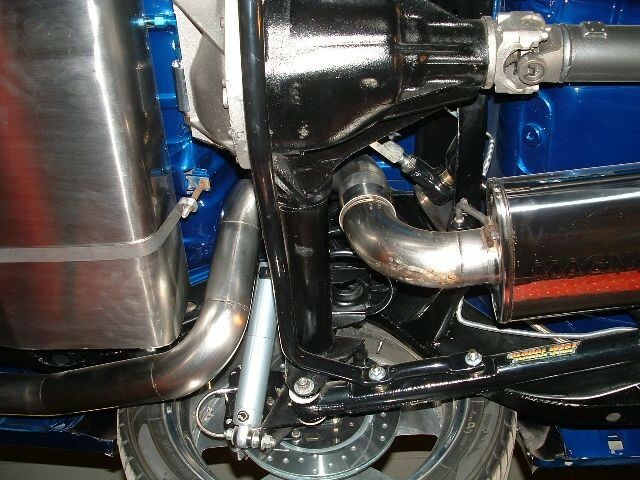 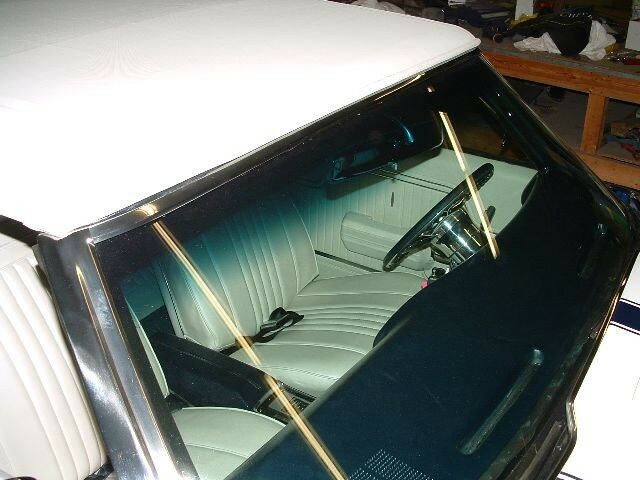 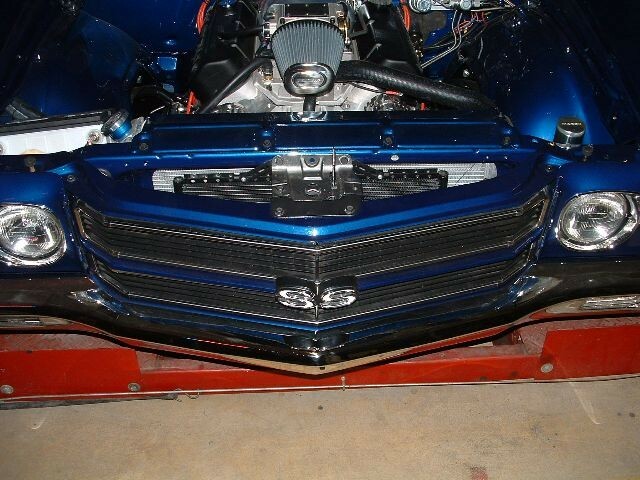 BUILT AND INSTALLED BY CHEVELLE SPECIALIST. 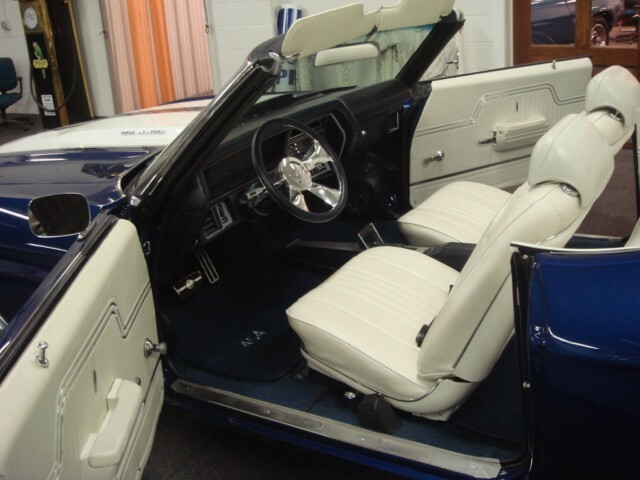 JUST LIKE A NEW CAR TOP TO BOTTOM, INSIDE AND OUT. 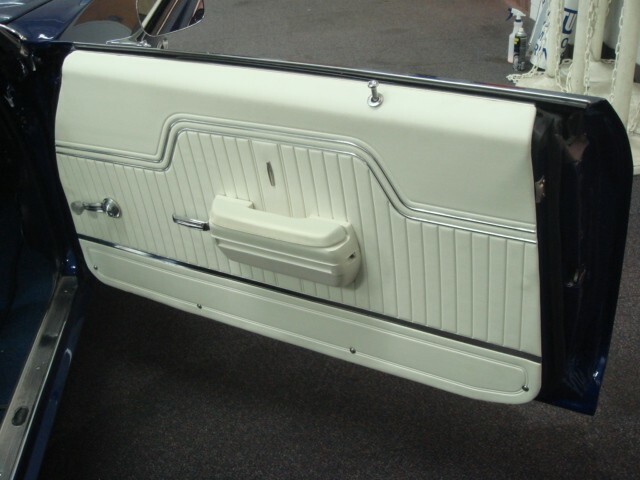 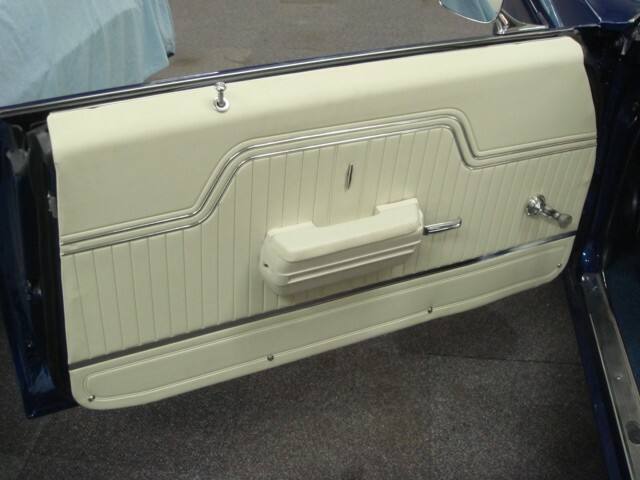 THE WHITE STRIPE HAS BEEN DONE IN PEARL WHITE.